The Center for Disease Control has declared insufficient sleep a national epidemic, with 50 to 70 million people in the U.S. suffering from a sleep disorder. He will destroy your dreams, literally. Insomnia is the juggernaut of sleep disorders. In a study of about 7,400 U.S. workers, about 23% were sleep deprived due to insomnia. About 30% of adults show symptoms of insomnia at any given time. From this data, it’s pretty safe to say that sleep is a commodity nowadays; and it’s in very high demand. Because of this growing need for sleep in the US, over the counter sleep aids such as Unisom, have started becoming very popular. What’s the deal with Unisom? Unisom is one of the most commonly used drugs for people struggling to fall and stay asleep throughout the night. Depending on the version of Unisom that you’re purchasing, it can contain one of two different active ingredients to treat symptoms of insomnia: Diphenhydramine HCL or Doxylamine Succinate. Diphenhydramine HCL v.s. Doxylamine Succinate? Overall, there’s not much of a difference between the too. Chemically speaking, both molecules do look different. However, they both treat insomnia and help you fall asleep by using essentially the same reaction mechanism. To make a long chemistry story short, Diphenhydramine HCL works by blocking out acetylcholine, the main chemical in your body used to activate muscles. This is what gives Diphenhydramine HCL its sedative properties and the reason why you may feel sluggish after taking it. 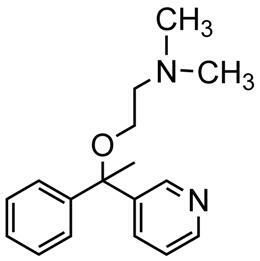 If the ingredient Diphenhydramine HCL looks familiar to you, it’s no coincidence. You may have seen it in bottles of Benadryl and other allergy medications. That is because Diphenhydramine is also used to treat allergies. Some allergy medicines, like Benadryl, are also considered sleep aids because of Diphendhyframine HCL’s mix of properties. Which types of Unisom use Diphenhydramine HCL? 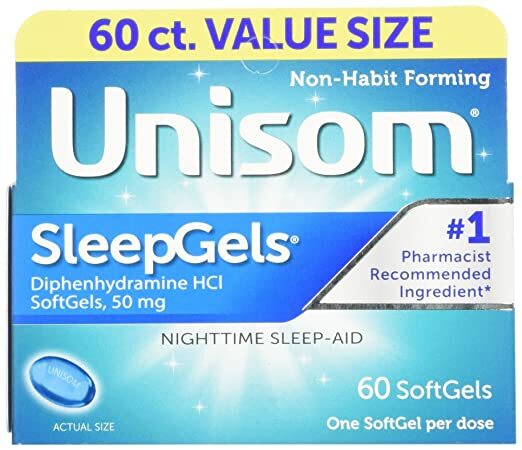 Unisom SleepGels– Contains 50mg/dose of Diphenhydramine HCL. The pills come in easy-to-swallow gels that leave no chalky after taste. Unisom SleepMinis– Contains 50mg/dose of Diphenhydramine HCL. These are the same as the SleepGels, except that they come as smaller gel pills that are easier to swallow. Unisom Liquid– Contains 50mg/dose or 30mg/dose of Diphenhydramine HCL. Comes as a bottle of liquid that can be taken without water. Unisom QuickMelts– Contains 25mg/dose of Diphenhydramine HCL. These will quickly dissolve in your mouth and save you the trouble of having to swallow a pill. Unisom PM Pain– Contains 50mg/dose of Diphenhydramine HCL and 325mg/dose Acetaminophen. These are good for nights where pain is keeping you up and preventing you from getting good sleep. Just like Diphenhydramine HCL, Doxylamine Succinate fights insomnia by blocking out the chemical in your body that allows you to move your muscles. Doxylamine Succinate is also an antihistamine, meaning that it can treat symptoms of allergies. Doxylamine Succinate is one of few over the counter drugs that have been cleared by the FDA for use during pregnancy. Many expecting mothers choose to use it because it also helps decrease nausea during pregnancy. Which types of Unisom use Doxylamine Succinate? Unisom SleepTabs– Contains 25mg/dose of Doxylamine Succinate. These pills are said to help you fall asleep 33% according to clinical studies performed by the company. About a year ago, I struggled with insomnia on a pretty regular basis. It wasn’t a full-fledged chronic insomnia; I usually wouldn’t wake up throughout the night after falling asleep. The struggle for me was getting there. It was pretty common for me to spend 30 minutes or so trying to fall asleep on most nights. After sleep deprivation started affecting my day to day activities, I started looking for solutions to improve my sleep. I remember thinking to myself that there’s no way this struggle to sleep is normal, there has to be a way to stop it. Shortly after, I decided to give over the counter sleep aids a shot. After some research, I chose Unisom because it was the most popular brand and many of the generic sleep aid brands would say “compare to Unisom”. Now, I’m well aware that generic brand drugs are generally the exact same as brand name ones. But, being in the middle of a war against insomnia, I wanted to go with a tried and tested weapon. And from what I’d read in different places, it looked like Unisom SleepGels was the way to go. So, did the Unisom tablets work? The Unisom SleepGels helped me treat my insomnia surprisingly well. After taking the pill, I was falling asleep considerably faster than I normally would. From what I experienced, I was definitely falling asleep within at least half the time that I usually do. After taking the pill, its sedative effects begin kicking in and you start feeling more tired and sleepy. This feeling helps you relax a bit and makes it that much easier to fall asleep. How long did you take Unisom for? I used the Unisom SleepGels for about a month. I would try to use the pill only on nights where I had to go to work in the morning. So that meant I would take a pill about 5 times a week or so. To take the pill, I would swallow it with a glass of water about 30 minutes before bedtime. The sleep gels aren’t too large, which makes them easy to ingest. I never took more than one pill a night. How long does it take for it to kick in? The Unisom SleepGels worked surprisingly fast. I would start feeling noticeably drowsy after 15-20 minutes of taking the pill. A small desire to sleep would start growing as more time passed by. Taking the pill on an empty stomach usually meant that the pill would start working slightly faster. This was a nice bonus because on busy weeks when you’re strapped for time, a few extra minutes of sleep can be a game changer. Did Unisom lose any effectiveness over time? Unisom works well despite taking it multiple times throughout the week. As with any drugs, the effects I felt during the first 2 times of taking it weren’t the same as drastic as the following doses. Despite that, I was always able to fall asleep faster than I would without having taken the pills. How do you feel the morning after taking the Unisom SleepGels? That being said, every time I took Unisom I only took the recommended dose of one pill during any given night – no more. It’s possible for people taking more than the recommended dose to experience trouble waking up in the morning and other side effects. What side effects are possible from taking the Unisom SleepGels? After taking the sleep gel, refrain from driving or handling any kind of heavy machinery. You start to feel the sedative effects pretty quickly after taking Unisom and this can be dangerous if you’re driving. – thickening of mucus secretions, etc. The Unisom SleepGels worked for me. However, I would strongly advise against using them regularly. As a rule of thumb, taking over the counter drugs for longer than suggested on the package (usually 2 weeks) is not a good idea. One reason is that these drugs are designed and cleared by regulatory agencies as a measure of temporary relief. A second reason is that they can lead to other health problems. The third reason is that there are other much more effective long term solutions to insomnia. Diphenhydramine HCL, the main ingredient in Unisom SleepGels and many other OTC sleep aids, is primarily an antihistamine. It blocks the receptors in your body that, when occupied, cause allergies. When taking Diphenhydramine HCL as a sleep aid, you’re actually using it for its secondary effect: as a sedative. As a result, you’re having a number of additional interactions in your body that are unnecessary towards helping you fall asleep faster and fight symptoms of insomnia. To put it in simple terms, using Diphenhydramine HCL for insomnia is like using a driver to play short game golf- you might make the shot, but why not use a putter and go with a more effective and precise tool? I’m not the only one saying this, you can check out this press release which talks about some of the possible long-term effects of Diphenhydramine HCL; some of which include an increased risk of developing dementia and Alzheimer’s Disease. So what other option do I have? The good news is that there are natural solutions to symptoms of insomnia that are more effective and better for you than Unisom and other OTC sleep aids. In fact, one of these options requires NO PILLS whatsoever. This means no unwanted side effects, no liver damage, no drug dependency, and no unexpected long-term health effects. The alternate option to skipping out on the daily sleep requirement is a higher likelihood of early death according to various research sources. Not to mention the additional strain to relationships and weakening of the immune system. This all just helps illustrate how important getting the necessary amount of sleep is. The Sleeping Without Pills programs provides one sustainable solution to this very imperative problem. Click here to learn more about the Sleeping Without Pills program. For such reasons, taking Unisom to help with insomnia is OK as long as you’re not using it for longer than the recommended 2 weeks. My experience with Unisom was certainly a good one, but it was never a permanent solution to my insomnia problem and so I had to move on to better options. One of the most fundamental solutions that have been shown to help people suffering from insomnia is following proper sleep hygiene. Rested Life has a regularly updated fact list on sleep hygiene that can help. That being said, don’t surrender on your battle to defeat insomnia. It may very well be the juggernaut of sleep disorders, but at the end of the day, it’s just a sleep disorder and it has a solution. Thanks for sharing this information on Unisom. I have problems getting to sleep and staying asleep. Unfortunately, Unisom didn’t work for me. Maybe I try one of the other kinds you mentioned, like the sleepgels or the sleep minis. In the past, I have tried the quickmelts, perhaps I needed the 50mg dose. I am currently taking 10mg of melatonin to help. Great post, thank you. Sorry to hear Unisom didn’t work out for you. These sleep aids vary in how effective they are for different people, melatonin is a sleep supplement but since it’s also naturally produced by the body, it’s a bit different. I’ll be writing a post about melatonin over the next few days for those interested. Wow, great points. I’ve been taking doxylamine for a couple of years now! It does work, but I have trouble falling asleep without it. I need to find a better solution, but yes, that particular form of Unisom works really well for me!